So, you’ve taken up the guitar. Awesome! Guitar is an absolutely amazing way to discover a whole world of creativity, passion and beauty. You could spend a whole lifetime learning and not exhaust all the possibilities. Maybe you want to play acoustic guitar, write and sing songs. Or maybe you want to play finger style blues or play electric blues, or heavy metal or classical or jazz or folk….. The possibilities are endless and your journey with guitar is sure to evolve over your entire life if you stick with it. In the beginning it’s a bit of work. As time goes by, you’ll learn to express the unique musical voice that each of us carries within. My advice is to persevere and really take the time and energy to learn to play - it will serve you for your entire life! As you’ve probably discovered, it’s not as easy as it looks and it takes some effort and work to progress. The biggest enemy or obstacle for beginner’s is frustration and giving up. Don’t let that happen to you. Having a good roadmap that outlines the basics that you need to learn is a good way to move forward and to evaluate your progress. At the moments of frustration (we all have a few of those, even when we’ve been playing a while), it’s good to go back over the list and recognize what you’ve accomplished. 3. Learn to add various more complex elements into your songs such as bass notes, more complex strumming, riffs and licks. This is a pretty good list of many of the basics that you’ll want to work on and master over the first year of playing. It is not an exhaustive list - you may cover other material as you learn. 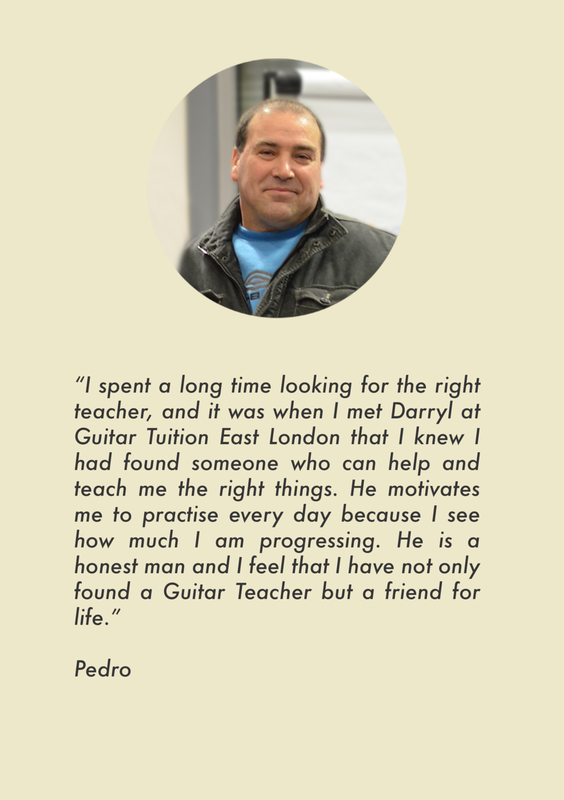 It is really helpful to have a great teacher and learning environment to help you learn and master the skills, to support, encourage and inspire you and to help you really enjoy and fall in love with this great endeavor that is playing guitar.